Beautiful Mardi Gras mask by 10 year old Farrin! She used traditional Mardi Gras colors of purple, green and gold for this colorful mask. This entry was posted in Children's Artworks and tagged children's art class, children's artwork, mardi gras mask, model magic project on June 22, 2015 by Olga Rogachevskaya-Chu. “Chocolate ice cream” by 6 year old Luka. Kids paint tints and shades of the chosen color to gain control of color mixing. 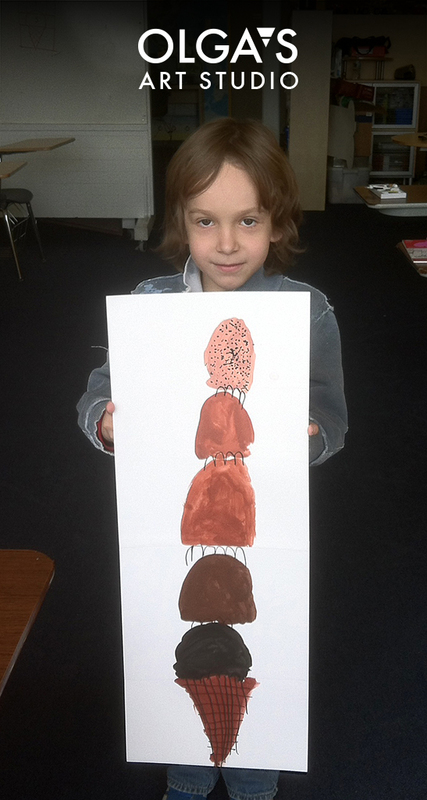 Luka expressed his love for chocolate ice cream in his painting. This entry was posted in Children's Artworks, watercolor and tagged children's artwork, Tints and shades, watercolor on June 22, 2015 by Olga Rogachevskaya-Chu.